Same old Arsenal, always injured. That’s the refrain once again as we will now suffer through the next 4-6 weeks without Theo and RVP. The incident that damaged the dutch master was innocuous and raises old questions about his durability. Whether he’ll be back within the allotted timeframe is anyone’s guess but we will miss his scoring and creativity from the center of the park. I guess the number 10 shirt hasn’t done anything to improve his luck with injuries. While Van Persie’s injury was picked up playing for Arsenal, it’s no such situation with Theo. Once again he’s a victim of that most nefarious villain, “international football.” The images that made the rounds on twitter thanks to Arseblog clearly showed Theo’s ankle at an unnatural position. (It also appears at the top of this post). The initial diagnosis was less than two weeks but once the Arsenal medical staff was able to get working on him, it ballooned to 4-6 weeks. Tack on the Arsenal Injury Multiplier™ of 3.4 and we’ll be without Theo for about 20.4 weeks. Maybe if he had a football brain he would retire from international football. It seems that’s where all his injury problems begin. What I find rather disappointing is the reaction of many Arsenal supporters to the news of these injuries. I can understand the frustration at another injury hit campaign beginning. I can understand being pessimistic about the teams prospects. (Although I don’t agree.) But I can’t understand abandoning the players. By the reaction of some fans, you would think that RVP and Theo wanted to get injured. When you look at Robin Van Persie, you should see a committed Gooner through and through. He loves the club, loves the fans, and has never given anything but complete commitment. His injury troubles are worrying, but we should resist the temptation to be capricious in our judgement. Van Persie is still a top talent and there’s no reason why he can’t come back and play 25 games this season. Considering his love and devotion to the club, he should be shown a little more patience from its supporters. As for Theo, he’s still extremely young, and this latest injury was clearly not the byproduct of any latent frailty. 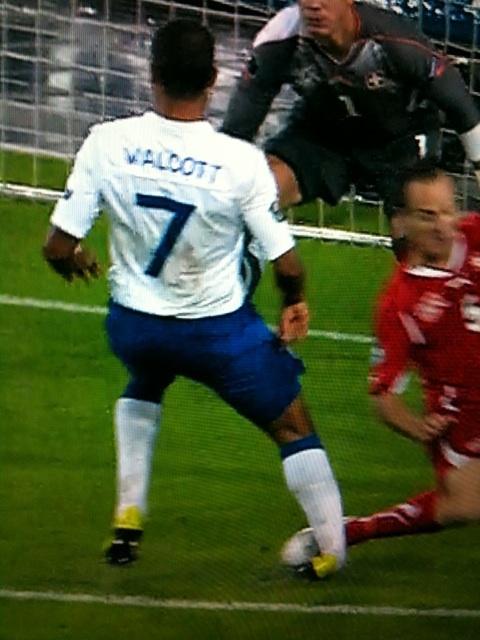 Walcott’s planted leg was taken out by a Swiss defender and his boot stayed in the pitch. It really could have been worse than 4-6 weeks. What’s devastating is that it halts Theo’s spectacular progress. His form so far this season, albeit in only three games, has been magnificent. He’s finally putting all his skills together and showing some great end product to go with his tremendous build-up play. Now he will have to sit out a while and we can only hope that he’ll be able to pick up where he left off when he returns. Theo is one of those rare “nice” modern athletes. He’s a good young man and seems to have a great head on his shoulders. He’s the type of player that you want to see succeed. I’d rather have an occasionally unfit Theo on my team, than 10 always fit John Terrys. Because he’s English, and because of the expectations that surrounded him, Theo has taken a lot of unwarranted abuse from the English media. But he’s our player, and we should be the first to defend him and support him. Let’s hope he comes back in scintillating form. It’s so frustrating losing players to injury so early in the season. And considering our luck with injuries over the last few campaigns, it’s even harder to take. But I don’t think the situation is as dire as some might suggest. We probably can’t afford any further injuries in attack at the moment, but barring additional losses, we have the needed weapons. Chamakh, Arshavin, Vela, Nasri, Rosicky and Eboue can all play one of the three forward positions. Of those six players, only Chamakh is really suited to play center forward. Arshavin and Vela can play on the left, Eboue can play on the right, while Nasri and Rosicky can probably play on either flank. There’s always the possibility of a player like JET coming into the side, but I can’t imagine Wenger handing him a start in a big game just yet. With Arshavin and Chamakh still available to play their natural positions, that really only leaves the right side of attack unresolved. That’s the position that Theo has been filling brilliantly, and RVP probably would have spent some time on the right as well. But Nasri is more than capable of playing in that position. He doesn’t give us the pace that we had with Theo, or the left foot of RVP, but he has more guile, a better dribble and great finishing. His passing might not be quite as good as Van Persie’s but I’d suggest that it’s better than Theo’s. So if Nasri plays on the right wing, then we really don’t lose too much. Remember, Nasri was the player most of us expected to have a break out season based on his pre-season showing. Now he’ll have the chance to prove those expectations weren’t unrealistic. I consider a front three of Arshavin, Chamakh and Nasri to be good enough to get us results. Vela, Eboue and Rosicky offer adequate cover for the wide players, but the real problem is in the middle. If Chamakh were to miss any time, we’d be back in the untenable position of playing Arshavin as our center forward. That’s an experiment that failed miserably last season and I don’t think any of us are eager to see it repeated. Vela and Eboue are great squad players, but the former has yet to show consistent goal scoring ability and the latter isn’t a natural attacking player. Should they be forced to come in for Arshavin or Nasri, I’d consider it a major step down in quality. Rosicky has been in great form this season, but he’s more suited to a midfield role, and still hasn’t recovered the scoring ability he demonstrated before his long injury layoff. So the key right now is to keep our remaining players healthy. At least until RVP, Theo and Nik get back. Then the next round of injuries can hit! Ironically, our team has never been in better shape defensively. While our attacking options dwindle, the reinforcements keep arriving at the back. Djourou and Squillaci will both be in the team on Saturday, with the latter playing for the reserves during the international break. If you want a mind-numbingly boring account of his 90 minutes, check with the official website. Suddenly we’re awash in central defenders, which is no bad thing. Losing Gallas in the summer might have weakened us a bit, but I’d take our four central defensive options this season over the four we had last season. Silvestre, Campbell, Gallas out, Squillaci, Djourou, Koscielny in. In my book, that’s an upgrade. In midfield, Denilson is fully fit and ready to go. Try not to explode out of your seat with enthusiasm. All kidding aside, I don’t see how Denilson is going to get a start in midfield right now. He could be reduced to the role of “seasoned veteran” in the carling cup side at WHL. He’s not going to supplant Diaby or Song on their current form, and there’s not much chance that he starts ahead of Cesc, Rosicky or Nasri as a creative midfielder. Add Wilshere into the mix, and it’s looking like a long waiting list for the man with Brazilian ankles. To Denilson’s credit, his quotes to the official site about staying focused for every game show great maturity and wisdom. It’d be wonderful if his approach on the pitch matched his words off it. The “real” football season essentially starts this weekend. It’s a match ever three or four days for the next few weeks and that’s when the depth of the squad is tested. I think we’re in good shape defensively for a change, but as I mentioned, we’re going to need to get some long overdue luck with our attacking players if we’re going to survive until our injured trio returns…in six months. In the mean time, the Arsenal medical staff is practicing the latest blood letting techniques and stocking up on quinine to treat any player who might pick up a knock. That’s it for today. The interlull is over and left us bereft of Theo again. Curse you interlull. I hope you die. But that means proper football is back. Hooray. I love you proper football.